Image caption The company said "the incident occurred at our manufacturing plant in Cottingham, East Yorkshire, this morning"
A worker has died in an incident involving a forklift truck at a caravan factory in East Yorkshire. 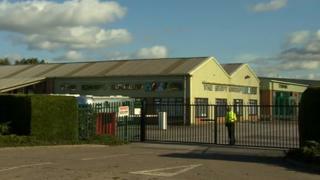 Humberside Police said the 65-year-old man died at Swift Caravans on Dunswell Road, Cottingham, shortly after 10:00 BST. The Swift Group said it was "deeply saddened" the employee was "fatally injured on site" and "our thoughts at this time are with the family." The Health and Safety Executive (HSE) is investigating. Humberside Fire and Rescue Service sent two fire crews and a specialist rescue support unit. The company's statement continued: "The incident occurred at our manufacturing plant in Cottingham, East Yorkshire, this morning. "All relevant authorities, including the HSE have been informed and Swift is assisting them with their inquiries. "At this stage it is too early to establish how this incident occurred but The Swift Group will be co-operating fully with any investigation that is launched."